Parents of Vision Impaired Children Inc (PVINZ) Provide A Community To Support Parents Of Children With Vision Impairments. Helping Parents & Whanau Gain Access To Resources That Support & Empower Them To Raise Children With Vision Impairments. Raising Children With Visual Impairments Can Be Challenging. 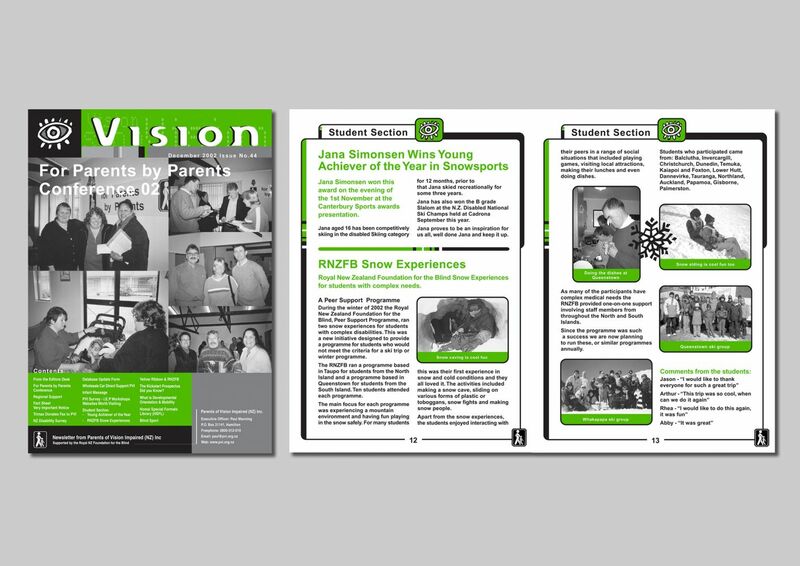 Project: ‘Vision’ a Bi-Monthly Magazine that communicates events and developments to parents about education for vsion impaired children. Format: 16 page A4 two colour Magazine. Brief: The client required the design to be modern & professional. It needed to be people focused. Solution: I designed initial template design for the magazine which included a header design for the cover, where I used a modern and brail font for the heading I also designed a template for the inside pages.